Arts Arlington New Art Installation at Music Studios of Arlington Arts Arlington Call for Artists: Transformer Box Project Arts Arlington Call for Artists: Chairful Where You Sit 2019 Arts Arlington Kickstand Cafe features Bikeway Haiku on its windows Arts Arlington Seyyide opens auditions for dancers to be part of Sarab-Mirage company Arts Arlington Blue Jean Ball! 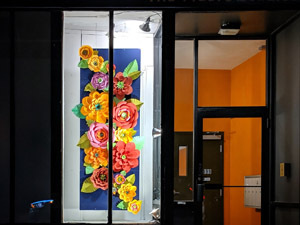 A spring inspired, three dimensional art work by artist Kaitlin Longmire has just been placed in the windows of the Music Studios of Arlington, located next to Helena’s on Mass Ave. near Arlington Center. This is the fifth art installation in a series begun last March, and made possible by a grant from the Arlington Cultural Council. 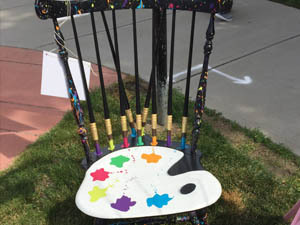 The Art in Windows program is supported by the Arlington Commission for Arts and Culture and the Town of Arlington Department of Planning and Community Development. Artists were invited to propose designs for this space and were selected by a jury comprised of members of the Commission for Arts and Culture, the Planning Department, and the Arlington Cultural Council. Kaitlin grew up in Arlington and received her undergraduate degree in painting and her master’s degree in arts administration. She resides in Arlington with her partner and two children. Although mostly focused on painting, her children’s excitement for building has sparked a new interest in creating three-dimensional artwork. Last year, she and her son built a kinetic sculpture and raced it in the Cambridge Community People’s Sculpture Race, coming in third place. ARTISTS LIVING OR WORKING IN ARLINGTON (ages 18 and up) are invited to submit designs for a new series of artwork to be painted between on transformer boxes along Mass Ave. The theme this year is IN MOTION, interpreted in any way you would like. Examples: transportation modes like feet, bikes, or buses; birds in flight, animals or humans running; or an abstract representation of movement. Designs should be bold and read well from a distance. 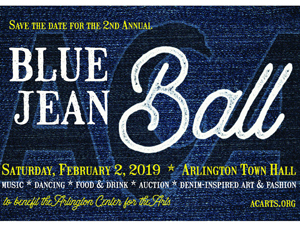 Submissions will be juried by members of Arlington Public Art, the Arlington Commission for Arts and Culture, and members of Arlington’s business community. A stipend of $300 will be awarded to each artist. Click here to visit the Chairful FAQ’s page. 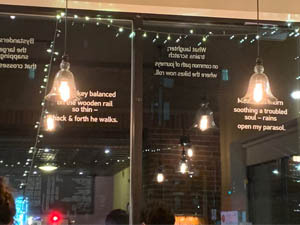 Emily Shea, owner of Kickstand Cafe, has offered the windows of the beloved Arlington cafe as the backdrop for 10 of the haiku selected from this summer’s community public art project. 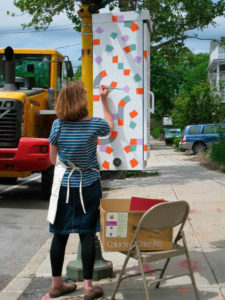 Composed by Arlington residents and others who enjoy the Minuteman Bikeway, the haiku have been printed out in white adhesive vinyl lettering and adhered to the inside and outside of the windows to engage and delight. We applaud Emily for her support of the arts in Arlington, and we look forward to more collaborations with the business community. Join Sarab-Mirage Dance Company experience from March to mid-Summer, on a performance-focused program in the Boston area. Our program offers training in performance skills, and periodic rehearsals in preparation for at least two performances in Greater Boston events. The program does NOT include technical training, participants are expected to continue their technical training by attending class regularly during this whole period. Again, participants must commit to keep up their training by attending classes every week (with Seyyide is most desirable for the purpose of congruence with the choreographic demands of the company, but if participant attends class with other teacher who provides similar technical instruction and challenges, it may be ok too, please discuss with the director, seyyide@seyyide.com). Video auditions will be accepted with a deadline of February 26, 2019. [There is no funding for this program at the moment, so participants need to contribute. There may be options for partial financial support for those who demonstrate a need].